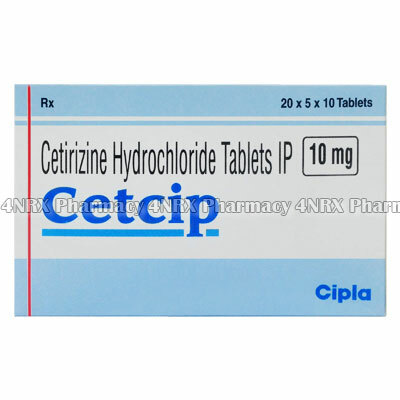 What is Cetcip (Cetrizine Hydrochloride) used for? Cetcip is an antihistamine tablet containing the active ingredient Cetrizine. It is most commonly used by people suffering from hayfever or allergies to relieve symptoms such as sneezing, itching, watery eyes, or runny nose. It can also help with the itching and swelling associated with by hives. How should I use Cetcip (Cetrizine Hydrochloride)? Cetcip comes in a strip of 10 tablets. Each tablet contains 10mg of cetrizine. Take half a tablet (5mg) to one tablet (10mg) per day. Take the exact dose prescribed by your doctor. What are the side effects of Cetcip (Cetrizine Hydrochloride)? Cetcip can result in adverse effects in some people. Some of these side effects are mild, and should only be a concern if they persist or become troublesome to you. Other side effects are more sever and may require you to stop taking Cetrizine. Notify your doctor as soon as possible if you experience any of these. Also tell your doctor right away if you experience any signs of an allergic reaction to Cetrizine. If you have had an allergic reaction to Cetrizine or any other histamines, make sure your doctor is aware of this before starting to take Cetcip. Antihistamines such as Cetrizine can cause drowsiness. You need to be especially aware of this if you need to drive a car or operate machinery while taking Cetcip. It is encouraged to take Cetcip for some time before driving a car so that you know how it will affect you. Drinking alcohol should be avoided while taking Cetcip (Cetrizine). Cetrizine is not expected to be harmful to unborn babies, but it can be passed through the breast milk.